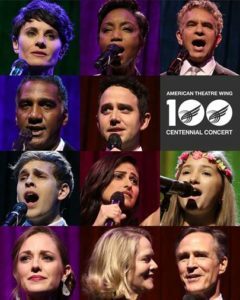 Broadway favorites Natalie Cortez, Evie Dolan, Santino Fontana, Heather Headley, Rebecca Luker, Norm Lewis, Beth Malone, Howard McGillin, Brian Stokes Mitchell, Laura Osnes, Taylor Trensch and more, perform as part of the celebration of the centennial of the American Theatre Wing. The evening celebrated the myriad of composers whose work have influenced the American theatre over the last century. Tony Award winner Brian Stokes Mitchell kicked off the show with the Stephen Sondheim showstopper “Being Alive” from Company. Norm Lewis, the first African American to star on Broadway as the title role in The Phantom of the Opera, sang the iconic “Music of the Night.” Beth Malone recreated her Tony Award nominated performance from Fun Home recognizing Jeanine Tesori and Lisa Kron, the first female writing team to win the Tony Award for Best Original Score. Heather Headley brought down the house with “What I Did for Love” from A Chorus Line. Hits from Showboat, The Fantasticks, South Pacific, and West Side Story were also performed. Tony Bennett made a surprise appearance recounting his fond memories of the support offered to him by the American Theatre Wing as a young GI returning from World War II, before the evening wrapped to “Aquarius/Let the Sunshine In” from Hair. Since launch in 2015, BroadwayHD aims to extend the reach of Broadway-caliber productions to theater fans all over the world. BroadwayHD is the only online streaming service of its kind, offering Broadway to all through an unprecedented theater experience. In addition to exclusive live streamed content, BroadwayHD offers subscribers unlimited on-demand access to a library of over 190 theater productions from the comfort and convenience of their own homes – or wherever streaming is possible. It’s the Broadway you know and love, curated from the stage to your screen.